Easter and I have a checkered past. 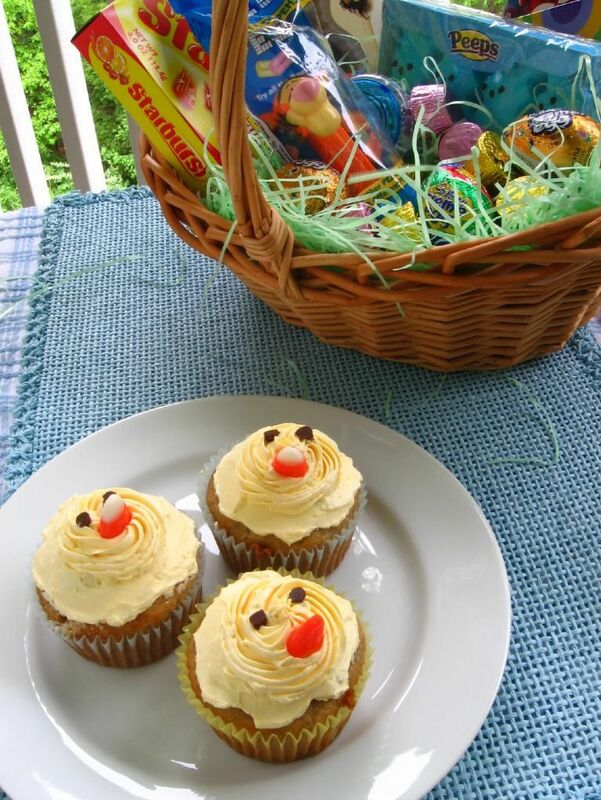 When I was a little girl, there were Easter baskets involved, and that seemed pretty awesome. An entire basket of treats and toys surround by that annoying-but-simultaneously-endearing Easter grass? A chocolate bunny bigger than my head that I’d eat about a quarter of before giving up? Plastic Easter eggs my mom had painstakingly filled with candy? Count me in. Other Easters, though, were fraught with peril. Well, okay, peril might be a little dramatic. Perhaps fraught with inconvenience. One Easter, for instance, I woke up and immediately realized that I was sick. I was nauseous, feverish, and definitely not interested in holiday cheer. My big plans of jumping out of bed and searching out the nearest stash of candy were dashed. It was awful; birds were chirping joyfully in the freshly-bloomed Bradford pear trees outside while inside, little Julie was lying, miserable and a tad melodramatic, in the floor. My parents brought my big Easter basket in and set it in front of me. They apparently thought the effect of this action would be to motivate me towards wellness. However, the piles of candy that should’ve been appetizing to me actually made me want to puke. I languished for hours before I so much as unwrapped a creme egg. 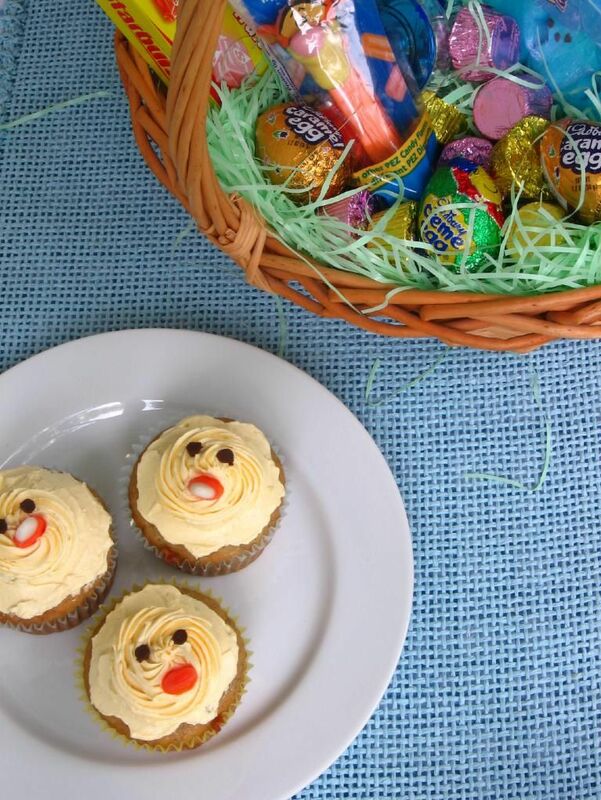 Maybe that Easter wasn’t the easiest one for me to celebrate, and nowadays I don’t even get an Easter basket, but the holiday is actually my favorite time of the year. Easter is when Christians celebrate the miraculous resurrection of Jesus Christ. He died in our place, taking the punishment for our sins, and the fact that He then rose from the dead is an unspeakable victory that I will try my best to speak: a triumph over the power of death and the power of sin. I walk around feeling bound a lot of the time. Bound by sadness, bound by financial worry, or bound by indecision; the truth is, what I have in Christ is the ultimate freedom. This holiday reminds me to rejoice, and to give away my worries — to recommit to living a free life for Him. To celebrate this year, I made these moist banana cupcakes stuffed with my favorite edible substance in the universe, coconut pastry cream, and topped with my other favorite edible substance in the universe, Swiss meringue buttercream. They’re heavenly, dense little bites of Easter JOY. I decorated the cupcakes with tiny chickie faces and some ginormous, delicious birds’ nests. The recipe below will tell you how to create the former, and keep an eye on Maranda’s blog in the coming days for instructions on how to create the cute nests! If you want to know more about Christianity, what Jesus did, and what it means for us, please leave me a comment below and let me know that you’d like me to email you. Make the Cupcakes: Preheat the oven to 350. Generously butter a mini-bundt cake pan or cupcake pan. In a medium bowl, whisk the flour, baking soda and salt together. In a separate, large bowl, beat the butter until creamy. Add the sugar and beat at medium speed until pale and fluffy. Beat in the vanilla, then add the eggs, one at a time, beating for about 1 minute after each egg goes in. Reduce the mixer speed to low and mix in the bananas. Mix in half the dry ingredients (the mixture may look curdled — just keep mixing), followed by all the sour cream and finally, the rest of the flour mixture. Fill each well of your prepared pan about 1/2 to 2/3 of the way full and rap the pan on the counter to remove bubbles from the batter and smooth the top. Bake for 25 to 30 minutes, or until a toothpick inserted deep into the center of the cakes comes out clean. Transfer the pan to a rack and cool for 10 minutes before unmolding on the rack. 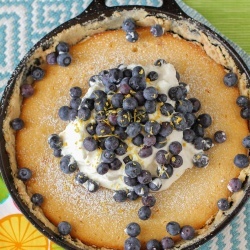 Let cool to room temperature before adding cream filling and glaze. Make the Coconut Pastry Cream: While cakes are baking and cooling, make coconut pastry cream. Heat the coconut milk, sugar, salt and vanilla bean in a medium saucepan over medium heat. In a bowl, whisk together the egg yolks and corn starch. Once the cream is hot, remove the vanilla bean, scraping out any remaining seeds and returning them to the cream. Add 1/2 cup of the hot cream slowly to the yolks, whisking as you add. Then pour the yolk mixture into the pot of hot cream and whisk. Continue to whisk with heat on medium-high for 3 more minutes. The mixture will turn thick and bubble. You need to continue to whisk for the full 3 minutes or the pastry cream will separate once it is cool. After the 3 minutes, whisk in the butter. Add the coconut flakes. Pour into a shallow dish to cool. Cover with plastic wrap pressed right against the pastry cream. This will prevent a thick skin from forming on the surface. Refrigerate for at least an hour or freeze for 30 minutes. Once it is cold, stir the pastry cream to loosen. Whip the 1/2 cup cream to medium peaks. Stir in 1/3 to the pastry cream to lighten. Fold in the remaining cream until the pastry cream is nice and light. To make Swiss buttercream icing: Combine sugar and 1/2 cup water in a small saucepan and bring to a boil over medium-high heat, stirring to dissolve sugar. Boil without stirring until syrup reaches 240° on a digital thermometer, about 5 minutes. Meanwhile, in a stand mixer with whisk attachment, beat egg whites on medium-high speed until soft peaks form. With mixer on medium speed, gradually pour in hot syrup in a thin stream; avoid pouring syrup on whisk. Increase speed to medium-high and beat until stiff peaks form and mixture is cool, about 8 minutes. Reduce speed to medium and add butter 1 tablespoon at a time, beating after each addition. (If at any time buttercream appears curdled, beat on high until smooth, then reduce speed to medium and continue beating in butter.) Once all butter is added, beat on high speed until buttercream is smooth and fluffy, about 1 minute. Beat in vanilla and food coloring. Use an offset spatula or the back of a spoon to smooth a layer of frosting over the top of the cupcake. Use a star tip to pipe a small circle of frosting in the middle of the cupcake (covering any imperfections). Give it two mini chocolate chip eyes and a candy corn beak (note: the color of these will start to run after a few days in the fridge, so if you aren’t serving these right away, you may want to wait to add them. You’ll have to remove the cupcakes from the fridge for a bit to let the frosting soften and then stick them on). Voila! *NOTE: This recipe actually makes twice as much coconut pastry cream as you need to fill the cakes. I split my pastry cream and made these with half, and filled donuts with the other half. You can also just double the number of banana cakes you make to fill, or find some other creative use for the excess cream. I suppose you could also try halving the coconut pastry cream recipe, but I didn’t want to fiddle with halving three yolks and a can o’ coconut milk. Mmh! I have been on such a coconut kick lately, these are right up my alley. I think I saw that you brought these to the blogger meet up. Now I’m even more bummed I missed it! I’m bummed that you missed it, too — can’t wait to meet ya! 🙂 I’m so in love with coconut, as well. It’s one of my favorite flavors. Funny, because I HATED it as a child! I definitely used to love being gifted with all of that chocolate and being allowed to eat it so early in the morning! 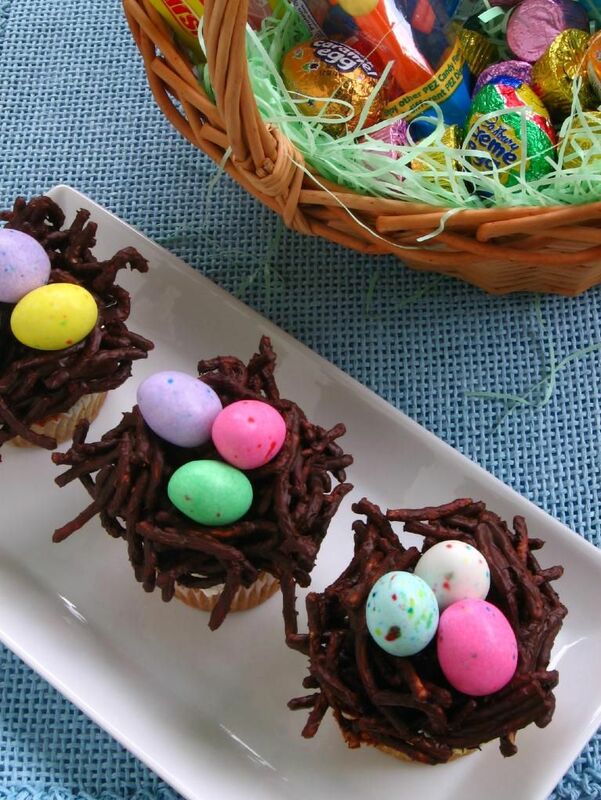 Maybe I’ll have to make myself a basket this year…I do have a hankering for some Cadburys. And these cupcakes. Filled with doubly delicious creams and so adorable! Thanks, Joanne! I want a Cadbury RIGHT now! Haha so did I!!! My Mom would always eat Almond Joys and I would sit there making a face because I was so grossed out by it. Now I’m obsessed!! This is such a lovely post! Despite the fact that I’m Catholic, it’s so easy to forget the meaning of holidays like Easter when they’re so commercialized. I really enjoyed reading what this holiday and Christianity mean to you. Very few people have the guts to talk about their faith so openly. Also, these cupcakes look super amazing. I’ve been wanting to try making swiss meringue buttercream, but I only have a hand mixer…I think I’m going to hold out until I can get a big stand mixer! Aw, thanks Maggie! I did hold out on making Swiss meringue buttercream until my family gave me a stand mixer — I knew it’d be a feat to do it otherwise! I hope you can make it soon. It’s amazing! I love your recipes, and can never wait to try them, but I live in Scotland, where we don’t have sticks of butter (just very large blocks). How much does a stick of butter weigh? Never mind 3! Many thanks. Aw, I love that quote! Thanks, Denise! Thank you for the joyous reminder of the reason for the season! 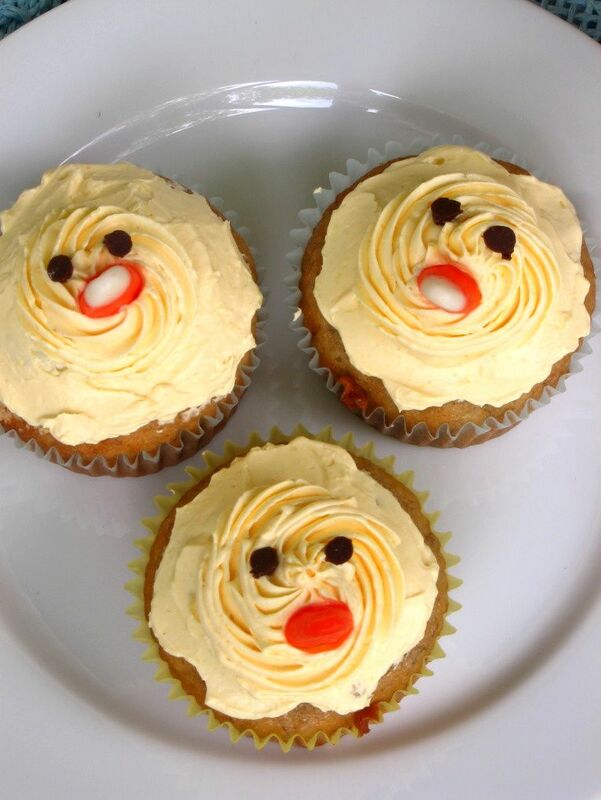 And thank you for sharing this tasty recipe…the cupcakes look so tasty and I love the cute chicky faces. Thank you, T! Happy Easter! Julie, thank you for sharing the real meaning of Easter! I feel so blessed to have found your blog, not only because of the many great recipes, but also because I have found a new “friend” who is a sister in Christ and a very special person! Happy Easter and God bless you. Aw, thank you Connie! God bless you, too! i’m so happy to have found your blog. i also walk around bound most of the time. sometimes it’s hard to realize that we ARE going to be okay! these look delicious and i love your blog. Thanks, Donna 🙂 Hope you love them! 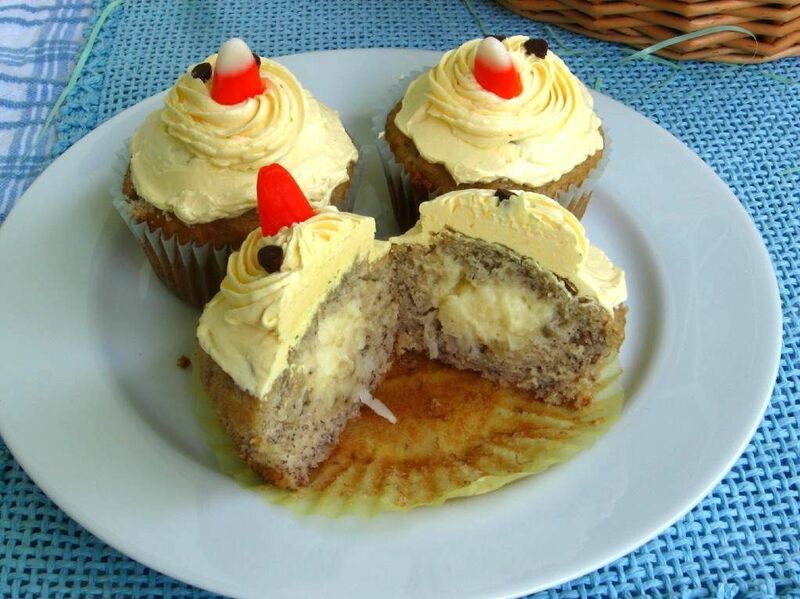 i saw those cupcakes on diana’s blog, was waiting for you to share the recipe! yum! Thanks, Natalie 😀 Happy Easter! 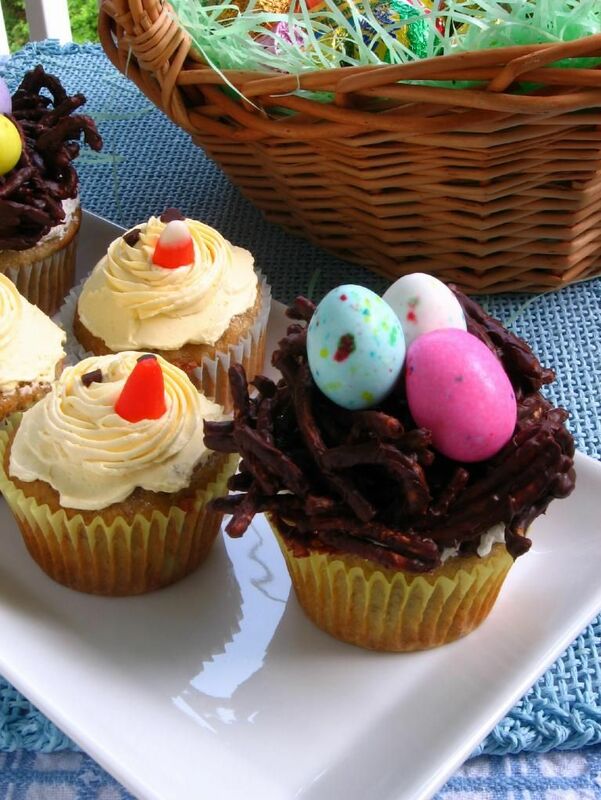 I just made these cupcakes for my husband and I’s first Easter together. We couldn’t wait until tomorrow and ate one immediately – these are to die for!! They’ll definitely be joining the ranks of traditional Easter food in our new house 🙂 Thanks so much for the recipe! Yay! This makes me so happy! I’m so glad you all enjoyed them! Whata lovely post. God bless you. You have a great blog and it means more that you are a believer in Christ. May God’s grace rest upon you. 1. OMG these cupcakes look and sound amazing! Coconut cream is one of my favorite flavors as well. 2. Thanks so much for your guest post (and sorry it took me so long to get over here and say thanks!). Thanks, love 🙂 No problem! There is NO GREATER gift than that of eternal life found only in the name of Jesus Christ. Your boldness is a sweet reminder of what all Christians are called to do!! After all, Jesus did die for those who would believe in Him. 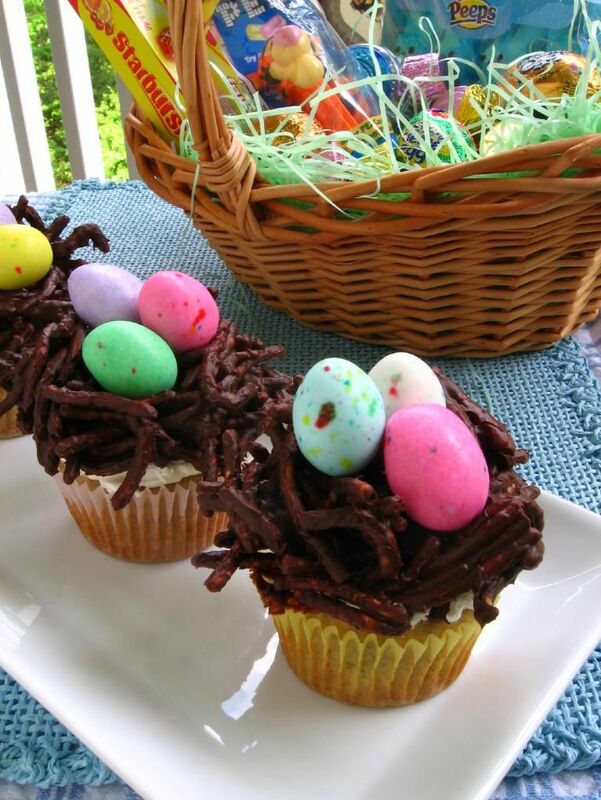 Love the egg nests. I look forward to making your recipe. Thanks again for sharing. Thank you so much, Linda. God bless you! 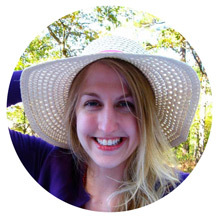 I just found this post while I was looking through (*coughstalkingcough*) your blog and I just wanted to say how refreshing it is to me to see another blogger profess her faith! As we come up on this Easter, I don’t have many people in my life who believe to share such a significant time with, and it gets hard. This helped me feel a little less alone. So thank you SO much and God Bless for this Easter season! I’m so glad, Angela. Be of good cheer, for He has overcome the world! God bless you!! My work friend April just shared with me today your website and the Easy Sopapilla Pumpkin Cheesecake Bars which she made for a friend’s birthday at work. So…being a chef I started roaming around on your site looking for fun new creative yummy things to make for some of my upcoming catering events..I was on the cupcake link and drawn to the Lemon Burst Fairycakes..